Mike Daisey has recently posted two Comments, but in case they get lost amidst all the others, let me feature them here to make sure they get heard. I probably shouldn't even engage in this--my blood pressure is shot enough as it is--but I do want to clarify something. "(Daisey has been performing "Invincible Summer" for months, but apparently still works from a handwritten outline within which he improvises. To each his own, when it comes to working methods, I say. I just sure hope, for his sake, he's at least made a xerox by now, if not actually typed it on a disk.)" This blog is a fairly well-read theatre blog, and the writer spends a lot of time writing very long posts about this incident. I do not understand why you would not spend a small amount of time with Google and other resources and inform yourself about the work I perform--it is not obscure or difficult. It's really tiresome. I find it insulting, your use of the term "still" in reference to my notes, and it tells me you don't understand my work in the least--you've never seen it, and you apparently don't read about it either. As for the rest, it's a free world (for now) and you have your opinion. You think I didn't react well--fair enough. I certainly would have preferred to react even better than I did. I do find it contrarian and bizarre that you're as concerned as you are for my behavior, when I'd posit there is other behavoir that is much more chilling, but hey--I love contrarians. Brief response: while it's true I didn't know much about the specifics of Daisey's work beyond his reputation when I started commenting on this Monday, I have since then read the Times article he links to, his Wikipedia entry, and other assorted reviews and appreciations. I do admit I hadn't fully understood the extent of his "extemporaneous" process, and for that I apologize. However, nothing I've read about him or his work in the last few days substantively changes my mind about anything else I've said about the incident. 1) Yes, David apologized--that is clear in the writing, I believe, and let me just say it again. He said he could never ask for my forgiveness, and then I gave it to him. 2) I am not a therapist, and I would never engage in therapy with this person--that is repulsive to me. I spoke with him, I listened to him, and I responded. I did my job as a human being--it is not rocket science. Factual clarifications are certainly welcome. As are Daisey's comments in general. Updated Addendum (12:15pm): To say something I recognize I outght to have made clear at the outset--I do respect Mike Daisey as an artist and do feel bad for what happened to him on stage that night. Anyone who has performed (and I have) knows that it takes a certain amount of bravery to act on stage at all, given how exposed and vulnerable you are to a live audience. Since I don't know Daisey personally and don't know his work very well, this automatic sympathy soon gave way to a more distanced and critical perspective, based on what struck me as personally interesting about the encounter. I recognize I've said things and made judgements about Daisey that might be hurtful to him. I can't apologize for them, since such is what critics risk doing every time they write. But I do understand why there has been such outpouring of support for him, especially from fellow theatre artists. Thanks Garrett--the apology about the work and acknowledging the clarifications is most welcome. Good for you Garrett ! Also Garrett, all differences aside, you deserve much credit for admirably resisting making Daisey/daisy puns in your post headlines throughout this ordeal. Yes, James, resisting was hard. Just think: if Mike never responded to me I would have had to sing "Daisy, give me your answer do..."
Hey, he didn't go for the pun in the title, but he did use "Daisey-chain" in the last post! That's at least a quarter-foul. I used "Please Don't Beat the Daiseys" in a comment at Voucher, so I'm in the penalty box, myself. I have several uncles who performed pretty much the same way at every family function . . .
And a couple of college professors who did the same whenever they had one too many glasses of wine . . . I guess Bruce Lee would call it, The Art of Writing Without Writing! But yeah, that water pourer - what a total douchebag. And I think you were maybe a little harsh on Daisey's reaction. I would have absolutely friggin' lost it. Anyway, point being: Keep calling it like it is (or like you think it is). Nobody wants a neutered Playgoer blog. Daisey is a whining windbag, full of himself and basically SO boring. I'm sorry the teacher/chaperone didn't pour water on his head so he could cool off and release some steam. "And then I forgive him. He is very quiet--he is obviously shocked. And I tell him, "I want you to remember that a liberal atheist has forgiven you today. I don't want you to ever forget that, as long as you live, do not forget what happened here. I don't have God behind me, but I speak for myself, and I forgive you for myself, and for you. Never forget this." My reaction -- immediate, and after days of consideration -- is that this seems a bit self-serving. 2) I'm also bothered that Mike seems to have tracked down and commented on loads of theater blogs that have covered this issue. Once again -- and also, again, it may just be my own flaws coming to the fore -- but it feels a bit like publicity chasing. LIke an attempt to make an interesting, relevant story into something more. But I was not on that stage. I don't know Mike at all. It's just what seems to be lingering in my head, now that everyone's starting to cool down. And, for the record, I've written elsewhere that I believe an audience has the right to walk out of a performance any way and any time they see fit -- that is the nature of the beast. But I do not believe that includes the right to threaten the performer or to destroy property. "But Nicholas Peterson , the marketing associate who dealt with the sale, described the exchange in a statement released yesterday. 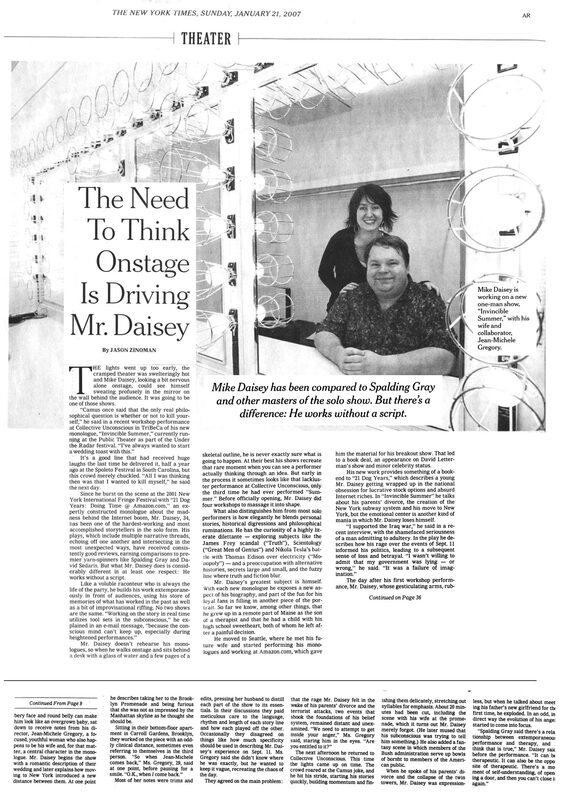 He says he told the Norco representative that Daisey's show contained "strong language, adult situations, powerful and emotional imagery, and also that The New York Times has referred to Mike Daisey as a 'master storyteller.' "
"Peterson says he told the Norco adult that another school group would be attending the performance; it was a senior English class from the private Brooks School in North Andover. And Peterson says he stated that "the imagery is not any worse than what students would see on television and the language no worse than what one would hear at the movies.' "
"But according to [Norco HS Principal] Johnson, the ART house manager told the group's adult leaders that it could not stop the show, as Daisey had already started. [After the concern over Daisey's pre-recroded obscene pre-show cellphone announcement.] In the lobby, after some discussion, a plan was hatched by ART staff and the Norco chaperones to have the house lights raised slightly and the group to file out. There was no way to explain this to Daisey, who was visibly rattled when nearly a third of the seats in the theater emptied." So the house staff KNEW the crowd was going to walk out, and were just trying to make it as smooth and quick as possible??? "I'm also bothered that Mike seems to have tracked down and commented on loads of theater blogs that have covered this issue. Once again -- and also, again, it may just be my own flaws coming to the fore -- but it feels a bit like publicity chasing. LIke an attempt to make an interesting, relevant story into something more." Sigh. You just can't win. I've been commenting because I'm engaged with the online community and I try to practice transparency. I've been actively blogging for seven years--it would be very odd if I didn't check my Google Alerts and respond to questions, opinions and so forth. For the most part I've been responding at theater blogs because that is my community, and that's the field and art form I'm interested in. I am *more* than happy to talk abouut *anything* else--I am more sick of this than anyone else, I'll wager.